PT United Tractors Pandu Engineering - UTPE or known as PATRIA is a rapid sustainable growth engineering and manufacturing company in Indonesia which was established in 1983. PATRIA provides engineering and manufacturing of components and attachments of heavy equipment. PT United Tractors Pandu Engineering is a member of Astra Heavy Equipment, Mining, Energy (Astra Group) and is a directly-owned subsidiary company of PT United Tractors Tbk (UT Group). At present, UT Group - one of the largest heavy equipment and mining companies in Indonesia - is the majority shareholder at PATRIA, with 80% of ownership. 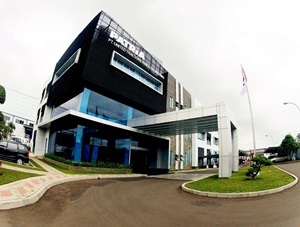 Based in Cikarang Bekasi, PATRIA now has 4 subsidiaries and 2 affiliated companies; PT Patria Maritime Lines (99%), PT Patria Maritime Industry (99%), PT Patria Maritim Perkasa (99%), PT Patria Perikanan Lestari Indonesia (99%), PT Andalan Multi Kencana (25%), and PT Universal Tekno Reksajaya (25%). According to PT United Tractors Tbk Annual Report 2016 as cited by JobsCDC.com, PATRIA's total sales dropped by 4% to Rp1.08 trillion, from Rp1.13 trillion in 2015. This condition is resulted from a 10% decrease in the demands for heavy equipment to support coal mining sector, a 41% decrease in demands from forestry and agro sectors; and a 9% decrease in demands from maritime sector. Bachelor Degree (S1) from reputable university majoring in Civil Engineering (Construction). Have a strong understanding of building architecture. Have a good skill in AutoCAD, D3. The candidates with prior experience in similar area for minimum 1-2 years is preferred. Fresh graduate are welcome to apply. Diploma Degree (D3) from reputable university majoring in Tax or Accounting. The candidates with prior experience in Tax Administration and Brevet A/B is preferred. Fresh graduate are welcome to apply. S1 from reputable university majoring in Mechanical / Industrial Engineering. Possess strong communication and planning skills. D3 from reputable university majoring in Mechanical / Industrial Engineering. The candidates with prior experience in spare parts manufacturing background is preferred. Fresh graduate are welcome to apply. S1 from reputable university majoring in Industrial Engineering, Statistics or Mathematics. Possess strong analytical thinking and communication skills. The candidates with prior experience in marketing and data analysis for minimum 1-2 years is preferred. S1 from reputable university majoring in Mechanical Engineering. Possess strong analytical and design skills. Advanced knowledge of 3D modeling software (preferably Pro E). Have a strong understanding of hydraulic system and electric system. D3 from reputable university majoring in Mechanical Engineering. Advanced knowledge and skill of process design, manufacture process, welding procedure, and technical design material standard. The candidates with prior experience in engineering process or manufacture/ material is preferred. Fresh graduate are welcome to apply. S1 from reputable university majoring in Industrial Engineering. The candidates with prior experience in manufacturing industry is preferred. Fresh graduate are welcome to apply. S1 from reputable university majoring in Law. Possess good communication skill and knowledge of industrial relation and labor regulations. The candidates with prior experience in Industrial Relations for 1-2 years is preferred. Fresh graduate are welcome to apply. Possess strong communication, planning, analysis and problem solving skills. The candidates with prior experience in similar area for 1-2 years is preferred. Fresh graduate are welcome to apply. D3 or S1 from reputable university majoring in Mechanical Engineering. Possess good communication skill, target oriented, and passionate to build career in sales. The candidates with prior experience in sales area is preferred. Fresh graduate are welcome to apply. Willing to be placed across Indonesia. S1 from reputable university majoring in Engineering or Management. S1 from reputable university majoring in Accounting. Possess good communication, problem solving, and administration skills. The candidates with prior experience in branch/ site administration is preferred. Fresh graduate are welcome to apply. JobsCDC.com now available on android device. Download now on Google Play here. Please be aware of recruitment fraud. The entire stage of this selection process is free of charge. PT United Tractors Pandu Engineering - D3, S1 Fresh Graduate, Experienced UT Astra Group February 2018 will never ask for fees or upfront payments for any purposes during the recruitment process such as transportation and accommodation.